Learn how to send your referral link and earn promo bucks. When new applicants sign up for RTX Platform using your referral link and spend $500 within 30 days of account approval, you each will receive $50 to put towards your campaigns. 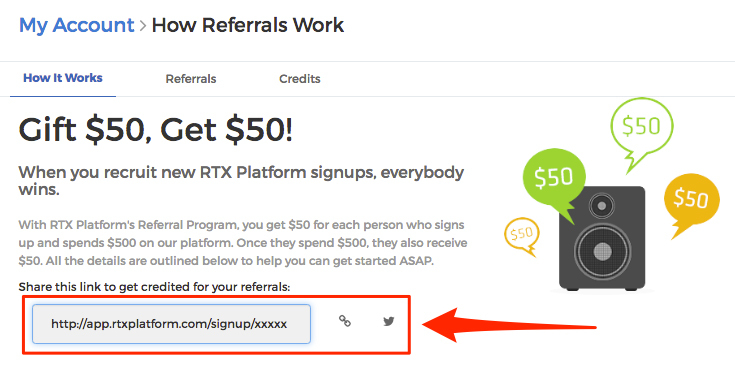 You share your referral link with anyone you think may be interested in signing up for RTX Platform. You can post the link on social media, spread the word on marketing forums, blog about it, add it to your email signature, etc. Someone signs up for RTX Platform using your link. You now have a referral! 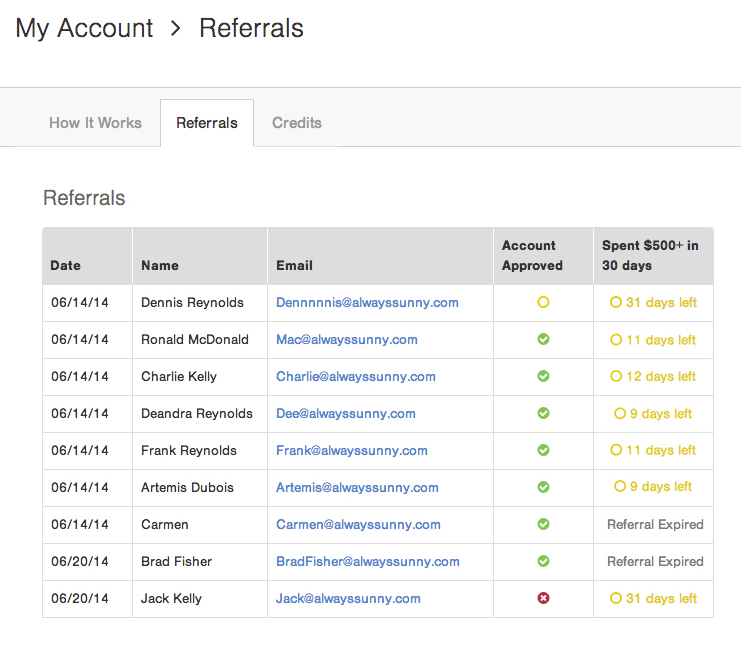 Your new referral spends $500 within 30 days of account approval. You and your new referral each get $50 automatically credited to your account when the 30 day period ends. Log into your RTX Platform account. Click "My Account" on the top righthand corner. Click "Referrals" from the left sidebar. Your unique referral link will be shown under "How it Works." TIP: Use the link icon to copy your referral URL to your clipboard for easy pasting, or use the Twitter icon to tweet it to your followers. 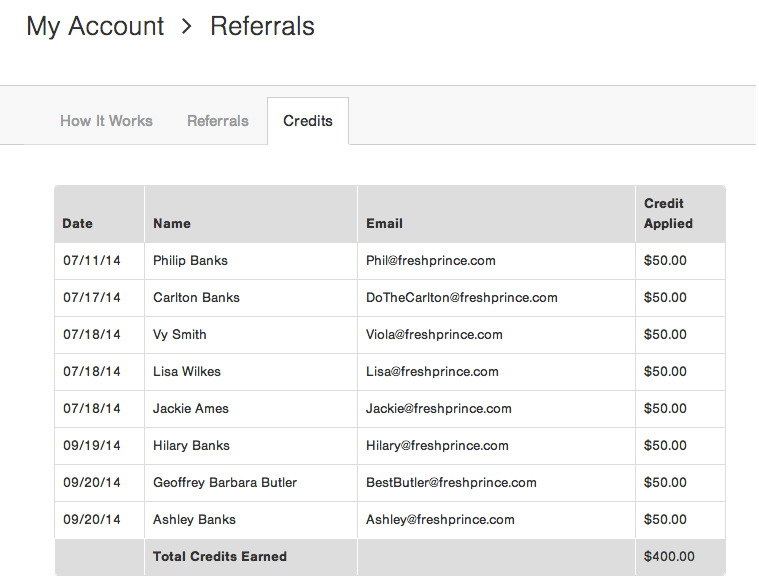 How can I track my referrals and credits? A green check mark means the account has been approved. A yellow circle means the account is pending. A red "X" means the account has been disabled. After 30 days, if the account has been approved and the referral has spent $500, the name of your referral will be moved to the Credits tab. I referred someone, but they didn't use my referral link. Can we still get credited? Unfortunately, the only way to get credit for referrals is by using your link. The new advertiser I recruited deposited $500 into their account. Now what? The new advertiser must not only deposit, but also spend at least $500 within 30 days after their account is approved in order for you both to receive your credit. The new advertiser I recruited has spent $500 before the 30 day mark. Why don't I see my credit? Your $50 credit will be available after the 30 day mark. How much can I earn in credit? There's no limit to the credit you can earn! The more advertisers you refer, the more you can earn.